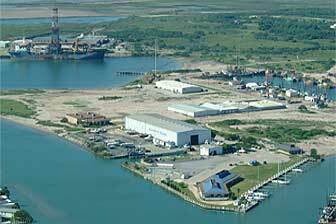 Port Isabel-San Benito Navigation District offers incentives to businesses and manufacturers in an effort to create a mutually beneficial partnership between what the Port has to offer and your business or manufacturing needs. The Port is the southernmost port along the Texas Gulf Coast and contains 726 acres of land. It is located on the southern tip of the Laguna Madre 9 miles north of the mouth of the Rio Grande River, within Cameron County, Texas. 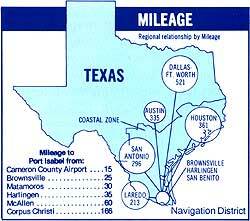 The Port is adjacent to the City of Port Isabel and the Town of South Padre Island, which is joined to the mainland by Texas' longest bridge---the 15,210 foot Queen Isabella Causeway. The Port is adjacent to the Brownsville/Harlingen/San Benito Standard Metropolitan Statistical Area (SMSA). Its location, with respect to other cities and SMSA, is shown lower left. The Port has a mean elevation of 15 feet above sea level and is located at Latitude 26'05' North and Longitude 97'10 West, which places it in a semi-arid, subtropical zone with an annual normal mean temperature of 73.6 degrees. Average rainfall registers 27.62". Prevailing winds are south/southeast. With a controlling depth of 36 feet, the Port's 1000 x 1500 foot Turning Basin allows maneuverability for vessels up to 700 feet in length. The Port is situated just 4.5 miles from the South Padre Jetties and sea lanes, with no overhead obstructions. Waters interfacing with the Port include Brownsville Ship Channel, The Intracoastal Waterway, Gulf of Mexico and Port Isabel Channel. The impact area of the Port, through its use of Intracoastal Waterway, extends from Corpus Christi to Brownsville and is approximately 184 miles long. • The Cameron County "Private Industry Council" will pay half of the wages for your new employees in training. • The University of Texas-Pan American can provide business planning and document preparation through the Center for Entrepreneurship and Economic Development. • The Lower Rio Grande Development Council can provide assistance for Small Business Administration or RGV revolving loan fund business loans. • The Navigation Distric can "build to suit" loading docks or manufacturing facilities for qualifying businesses.